A couple weekends ago the Bachelorette season finale was on. Of course I invited some girls over to watch it with me and it turned into the first “party” we’d hosted so far in the new place! 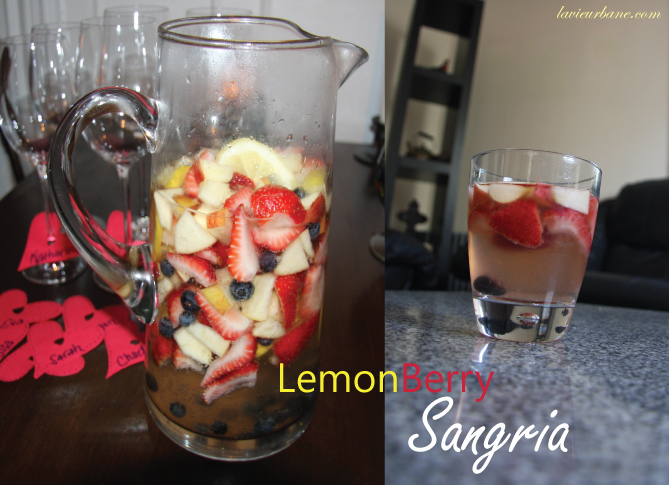 It was all kinds of fun….and I made a few desserts and some Sangria for refreshments. First, I found these yummy things and had to try them since they seemed so appropriate for a “Bachelorette” party (and um, they looked delicious for obvious reasons)! 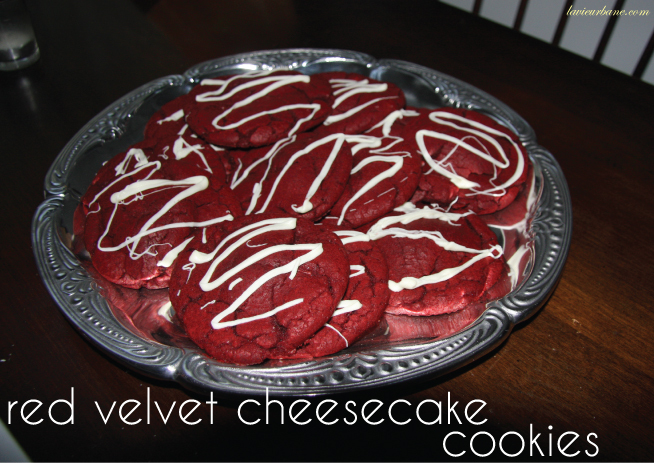 These Red Velvet Cheesecake Cookies were just as amazing as the blogger said they would be. Be sure to make them in advance though as they do take quite some time with chilling and rolling and all…. In a large bowl, combine the cake mix and flour. Whisk together until clumps disappear. In the bowl of a stand mixer, add the cake mix with the flour, eggs, oil and vanilla and mix until smooth. The dough will be really oily (that’s normal!). 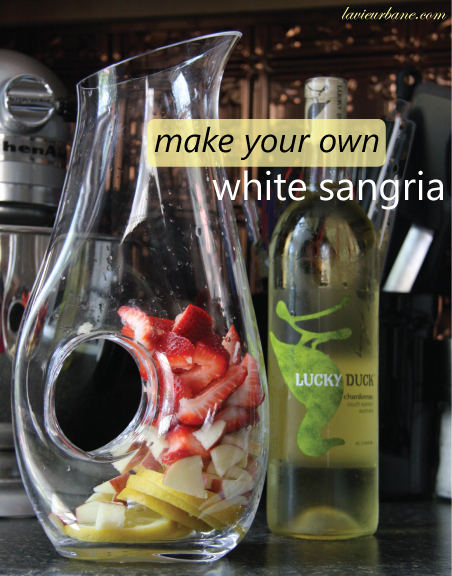 Wrap it in plastic wrap and refrigerate for at least two hours. Preheat oven to 350 degrees F. Lightly spray a large baking sheet with cooking spray, or line it with parchment paper or silicone baking mat. To assemble the cookies, take about 1/4 cup of red velvet cookie dough and flatten in your hands. Be ready to get messy! Place a ball of cheesecake filling in the center and wrap the cookie dough around the filling. (If the dough starts to crack when you’re wrapping it around the filling, don’t worry, just press it all together by cupping the dough between both your palms…). Gently roll into a ball and place on prepared baking sheet. Only bake 3-4 cookies at a time because the cookies are pretty big and will spread. Bake cookies for 11-13 minutes or until they begin to crackle. 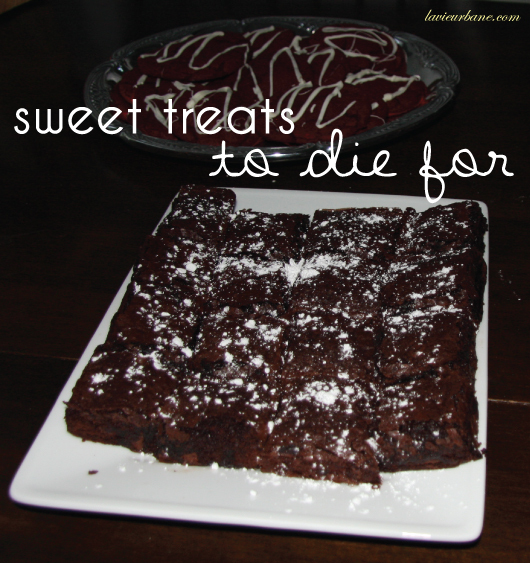 Let them cool on a baking sheet for 5 minutes, and then transfer to a wire rack to cool completely. Melt the white chocolate chips in a microwave safe bowl or over a double-boiler. Drizzle the white chocolate over the cooled cookies. Hope you enjoyed this post! 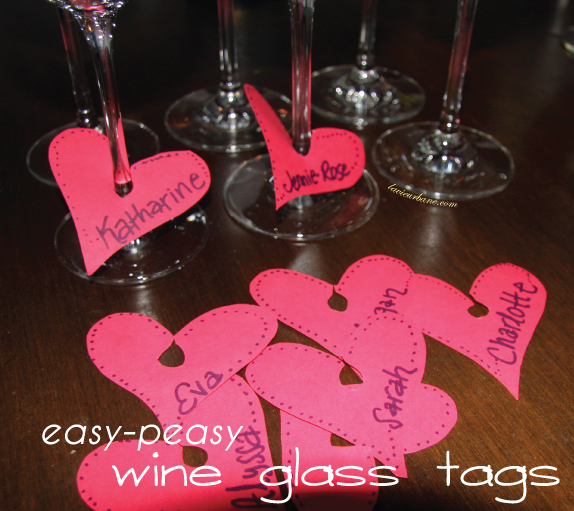 Now let me know if you have any other creative ideas for wine glass charms/tags. And let me know what you think of those cookies if you decide to try making them!